I-league champions Chennai City FC defeated ISL side Pune City 4-2 in a thrilling Hero Super Cup pre-quarterfinal encounter at the Kalinga Stadium in Bhubaneswar. 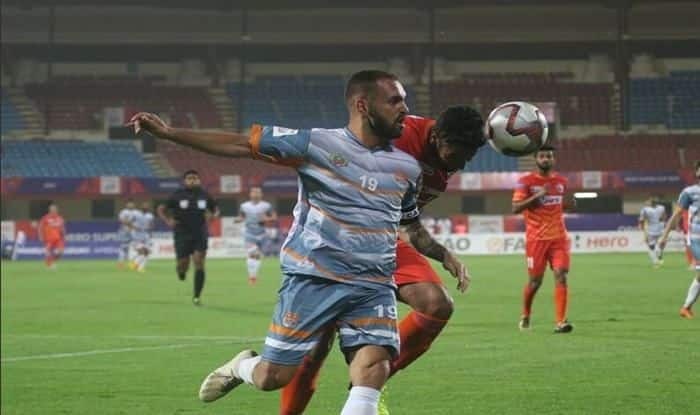 The champions of I-league Chennai City FC were aided by a clinical performance by Pedro Javier Manzi, who netted a hattrick in a 4-2 win over FC Pune City at the Kalinga Stadium in Bhubaneshwar. The match, which took place on Sunday evening gave both the sides a chance each within the first three minutes but neither could make the most of it. Pune’s midfield comprising of Adil Khan and Marko Stankovic held control in attack and defense, giving hardly any space to the likes of Pedro Javier Manzi and Nestor Gordillo to work with. Pune had two glorious chances in the space of ten minutes around the midway point of the first half. Adil released Marcelo Pereira on the left, who in turn picked out Iain Hume free inside the box. The Canadian headed his ball on target, but Mauro Boerchio pulled out a sensational save to keep the match goalless. Hume then, turned provider for Marcelo, for the second of those chances, but the Brazilian lobbed his shot over the onrushing Boerchio. Chennai attack had been quiet until then, but somehow managed to break through the reasonably sound Pune rearguard to open the scoring. Nestor exchanged some neat passes on Chennai’s left-hand side and ran at will towards the backtracking Pune defense before picking out Ameerudeen Mohaideeen on the right. The forward squared the ball leaving Manzi to do the rest. Chennai’s second goal came shortly afterwards as Nestor turned on a second ball and immediately released the number 19, who turned Matt Mills inside-out before slotting the ball past a helpless Kamaljit Singh. Pune looked to be stunned by then but were back in the tie five minutes later. Chennai defender Gaurav Bora was caught on the ball by Marcelo, after which he slammed the ball past Boerchio leaving the scoreboard at 2-1 in favour of the I-League champions going into the break. Minutes into the second 45 and Chennai found themselves a man down. Defender Charles Lourdusamy went in with his studs up against Hume and in doing so he fouled the Pune number seven following which the referee gave him his marching orders. Up at the other end, Marcelo stormed his way past four defenders into the Chennai box. Bora was unsuccessful in legally handing the Brazilian’s trickery and fouled him, for which he was then penalized. Stankovic stepped up to take the spot-kick and converted with ease. Pune equaliser spurred Chennai on and were rewarded for their adventure right at the hour mark. Adil used too much of his body on one of the opposition attackers in his own box, giving the referee another opportunity to award a penalty. The prolific Manzi stepped out and dually obliged to hand his team the advantage. Pune rallied on to make their numerical advantage count, risking men forward and leaving the dangerous Manzi with all the room to roam in. Fifteen minutes later, they were made to rue that choice. The Spaniard, after being released by Nestor, ran at Pune defense and looked to feed it back to his countrymen, who smartly dummied the pass to allow another Spaniard, Sandro Rodriguez to get on the scoresheet. Pune again by Marcelo tried to make something of the last quarter but were thwarted in their attempt by some resolute Chennai defending.